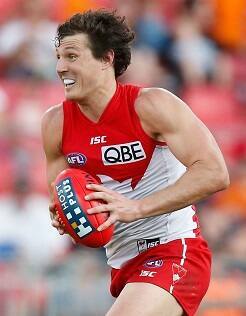 Kurt Tippett was dominant against the Giants on Saturday afternoon. Sydney Swans coach John Longmire believes Kurt Tippett's five-goal haul against Greater Western Sydney on Saturday was the forward's most complete game of the year so far. The 28 year-old had a season high 21 possessions – 12 of those contested – plus eight marks in the Swans' dominant 89-point win over the Giants at Spotless Stadium to be the best big man on the ground. Tippett sparked the visitors with three goals from four marks in the opening term opposed to young GWS defender Aidan Corr, who was unable to handle the physicality of his more experienced opponent. Longmire said Tippett's form while playing forward and also in the ruck was a key factor behind the Swans' victory. "His ruck work has been very good which probably doesn't get as acknowledged as it should, so it's not just about the goals he's been able to kick. He's flexible now and he's been really consistent," Longmire said after the match. "Probably in a combination of the roles it was (his best game the year)." Tippett's body hasn't allowed him to play as a genuine ruckman for the Swans until this season with a host of knee issues forcing him to play purely as a key forward in previous seasons. Now that the former Crow is fully fit and has gained confidence from a full pre-season, he's relished his dual role in 2015. "I like playing both (positions) and that’s been my challenge this season is to try and develop my game so I can play both really well," Tippett said post-match. "A couple stuck up forward today and I got a couple in the middle as well. "Playing both roles these days I don't really worry too much about my match up. I know I'm going to match up on a number of different guys so I just try and worry about what I'm doing. "I'll continue to do that for the rest of the year because it's an important role for the side. "I can't complain having had a couple of injury-plagued seasons - to be feeling as good as I am at this time of the year, I'm really grateful for it." Tippett wasn't the only Swan to cash in against the Giants with Sam Reid also producing his finest outing of the season in perfect conditions for the marking forwards. The versatile 23-year-old has been in solid touch without being outstanding as a defender and forward at times in 2015, but took 10 marks, kicked a goal and had 18 disposals for the winners. Tippett said that Reid's display was encouraging and that with Lance Franklin still to return to the side from injury, plus veteran Adam Goodes also providing an option inside 50, the Swans' forward set up was looking dangerous. "I think it's been working well. You saw the way 'Reidy' was attacking everything in the air and that’s something we encourage him to do because he's so great at it," Tippett said. "Adam is playing a super role for us and then you see the young guys in there putting so much pressure on, it's fantastic for our side. "We're still developing and working together but I think it's starting to gel." Debutant James Rose was able to cap a dream debut against the Giants when he came on as the sub at three-quarter time and booted three goals in a row as the Swans ran all over the home side. Longmire said the South Australian did well to take his chance. "We always thought 'Rosey' has got a lot of ability and he's fitted into the club really well," Longmire said. "He had some challenges early on coming from another state as all young kids do, and it's a credit to our staff and his ability to be able to adapt and embrace the footy club. "He's been terrific, he gives us something a little bit different in our front half. He's very smart, he's very clever, and he finishes really well as we saw. "We know it's not going to be as easy as that for him every week, but it was good to bring him on."